Just sit right back and you’ll hear a tale — a tale of a fateful trip, that started from this tropic port, aboard this tiny ship. The mate was a mighty sailing man, the skipper brave and sure. Five passengers set sail that day, for a three hour tour. A three hour tour…. Anyone familiar with the 1960s television show Gilligan’s Island? It’s all over syndication-land so even if you’re not old enough (as I am) to remember the original, you may be familiar with it from reruns. It was a sitcom about a group of tourists who sign up for a three hour boat tour and ended up stranded on a small deserted island for the duration of the series. Keep its theme song in mind as you read this post. During the Zion part of our trip, we took a half-day to visit the tiny town of Kanab, about an hour southeast from Zion. 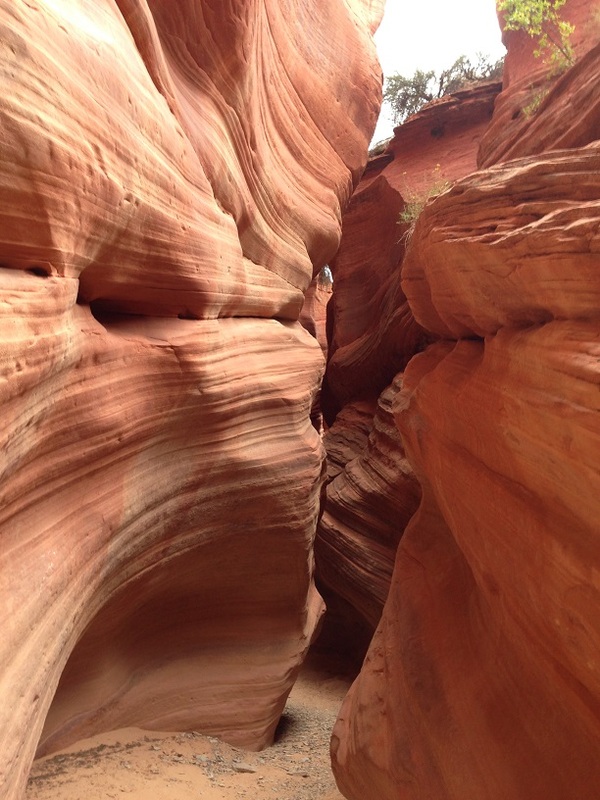 We went for a tour — a three hour tour — of a slot canyon and an expanse of white, swirling sandstone called the White Wave. The slot canyon was advertised as a less crowded and less commercialized alternative to the very popular slot canyons of Antelope Valley. The White Wave was advertised as a consolation prize for those who haven’t been able to get a permit (which can only be had by lottery) to visit the colorful waves of the Coyote Buttes, in the Paria Canyon-Vermillion Cliffs wilderness area. Someday we’ll try for a permit to Coyote Buttes but for now, we were happy to see the paler version. 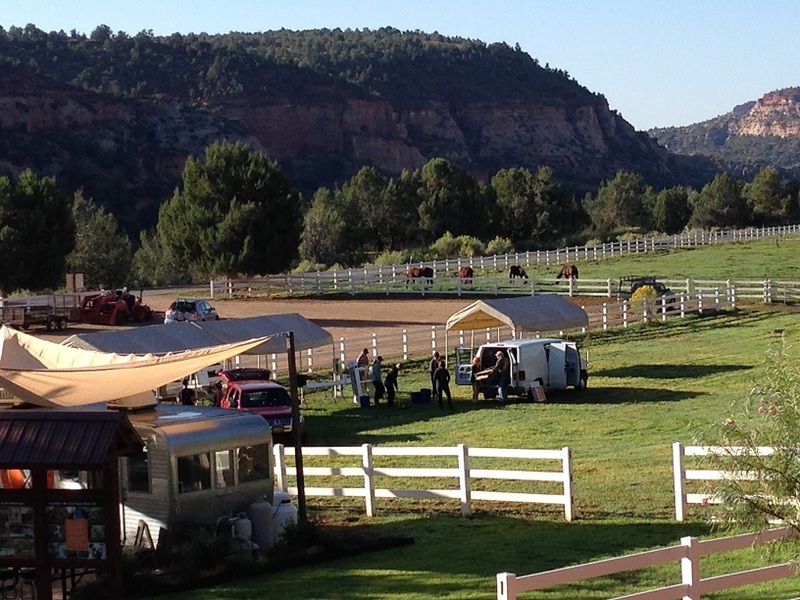 We were making the trip with Dreamland Safari Tour, based a couple of miles outside of Kanab. We were joined on the tour by our guide, Ron, and two other couples. 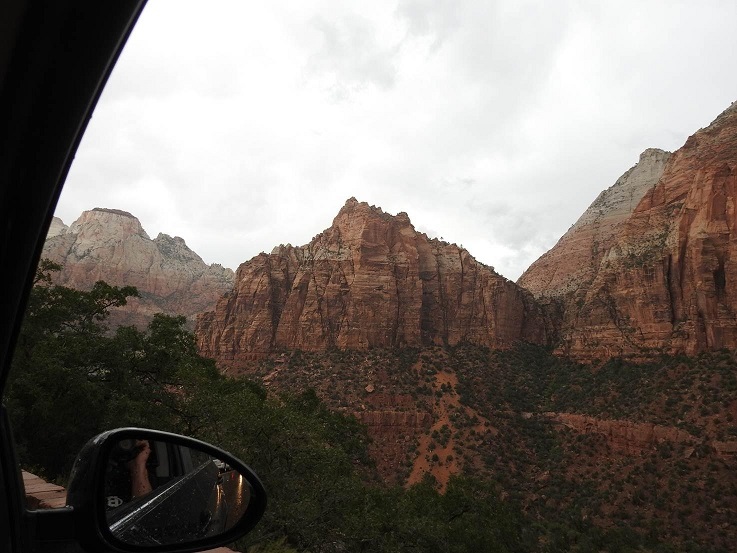 Six passengers (not five) climbed into a Suburban (let’s call her the Minnow) and we made our way into the Kanab canyons. Our first stop was the White Waves. 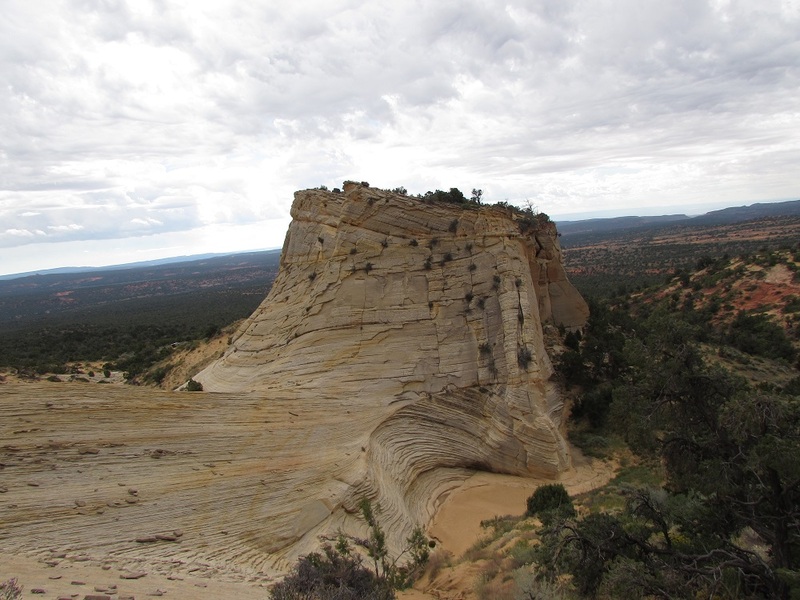 Waves are undulating curves that are carved into Jurassic-age sandstone. 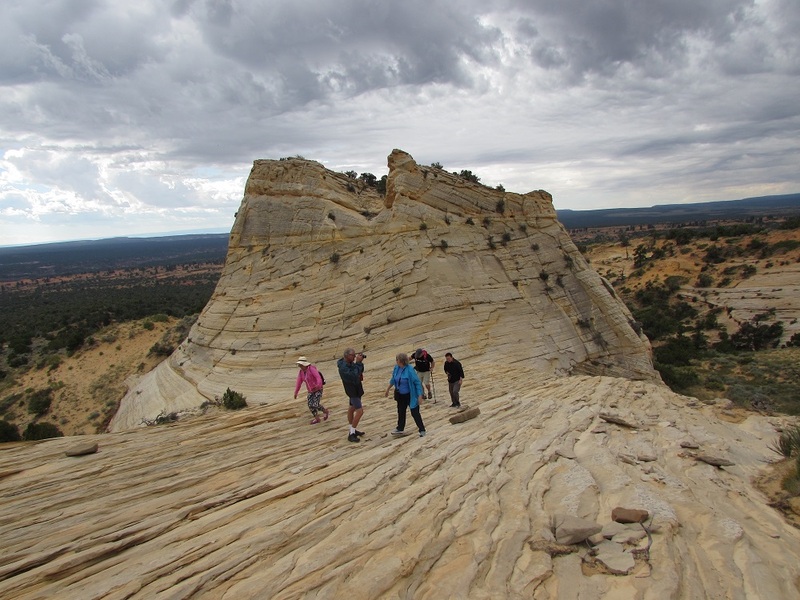 The formations were beautiful and interesting, but just as cool was the climb onto the rocks to get to them. I’m so used to the over-the-top, litigation-averse safety standards at most public spaces in the US that anything that comes even a little close to the edge excites me. 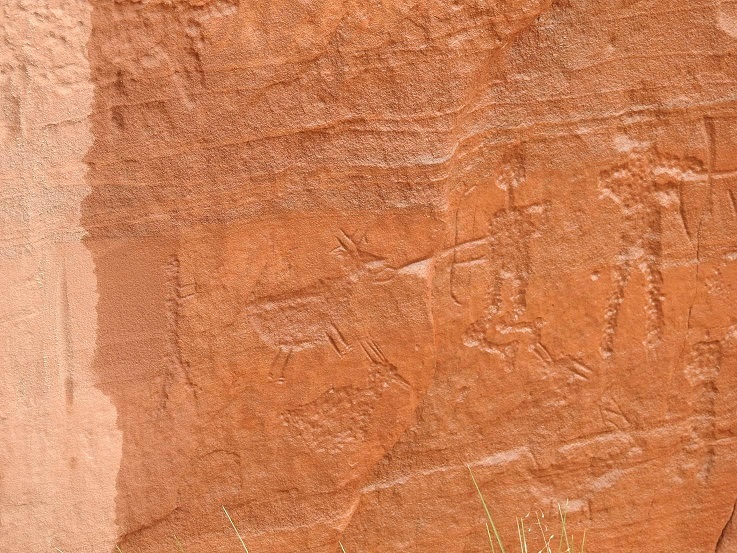 On the side of this formation were petroglyphs, very similar to the spacemen motif we saw at Bryce. So these are probably also Fremont, circa 600-1300. Thunderstorms had been in the area for a couple of days and before we’d left Zion, we made sure that our tour hadn’t been canceled. Now, about mid-morning, the threatening clouds were closing in on our location. 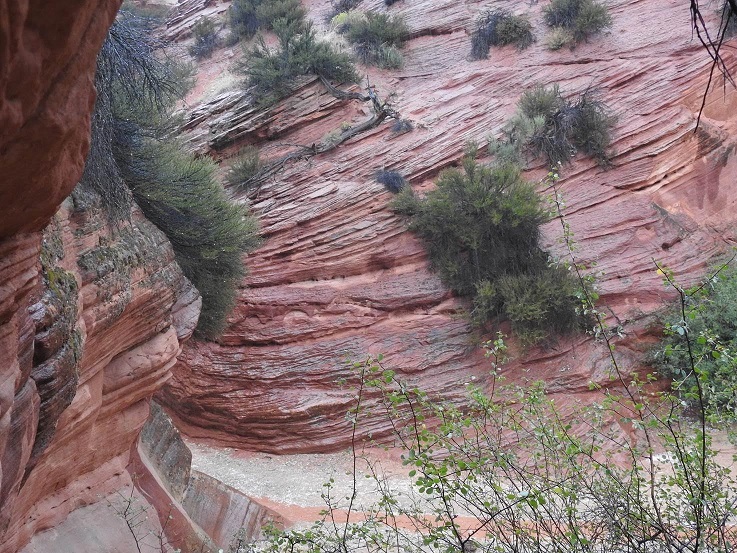 But Ron, our guide, decided it was worth the risk to take a run to the slot canyon. On our way through the slot canyon, Ron pointed out “climb outs” where we could get out quickly, or that led to carve-outs with overhangs, where we could take refuge in a storm. Good thing, too, because about 30 minutes into the canyon “the weather started getting rough….‘ Our ship wasn’t tossed, but we started being pelted by large white balls of ice. Hail. In southern Utah. Who’d a thought. We made an about face and scurried back through the canyon. Within minutes, before we could get out, the hail turned to hard rain and we were covered in the red mud created when water bounced off the surface of the canyon. A stream formed around our legs and quickly rose to about a foot deep. Ron decided it was time to take shelter. We climbed up to a shallow cave about 30 feet above the canyon floor and watched the water continue to rise as it rushed by. I have to say, though, we never felt threatened. Ron did a wonderful job of making us feel safe, and actually keeping us safe. I have no idea how long we were on that ledge but after the rain slowed and the water receded a bit, Ron deemed it safe enough to wade in the knee deep stream, to make it back to the Minnow. I was never so happy to be crammed into a vehicle with five other wet, smelly, red mud-covered people in my life. I was never scared, but I was very cold. Our three hour tour had stretched — not long enough for a television series — but an extra couple of hours. Despite our unexpected adventure — or maybe because of it — I’d highly recommend Dreamland Tours if you’re planning a visit to the Kanab area. We were supposed to take a slow ride back through the canyon to Dreamland HQ, but Ron made a beeline back. The part we missed was a ride through some property belonging to the Best Friends Animal Sanctuary, which bordered the slot canyon/White Wave area. Mr. HT and I were fine skipping it because we had a reservation to tour the sanctuary the following day. 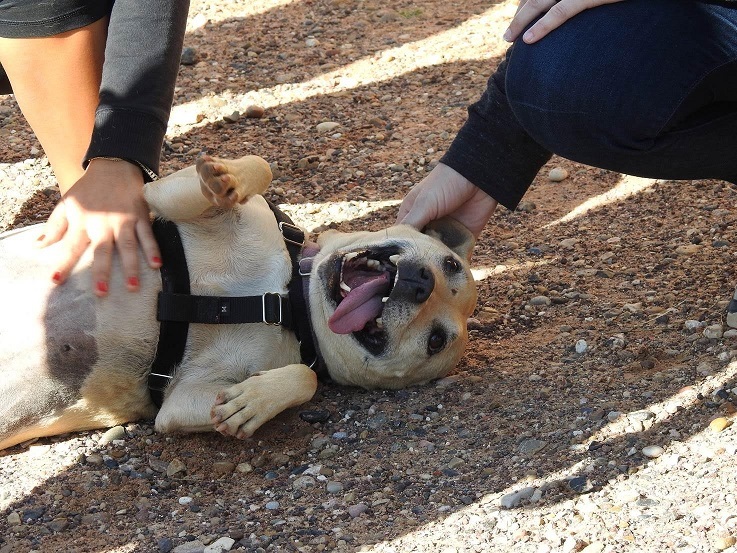 Kanab may be best known as home to Best Friends, which became famous when it took in some of the pitbulls who had survived Michael Vick’s dog fighting operation. The sanctuary and the pitbulls became the focus of a series, called Dogtown, on the National Geographic Channel. While I won’t go into our Best Friends tour here, I will say that the tour is a must for any animal lover. Seeing abandoned animals is heartbreaking, but the beauty of the setting, the state-of-the-art facilities and the love and attention that the animals receive gave me some hope for humanity. It was unbelievable. Definitely one of the most visually stunning places I’ve ever seen. That must have been rather scary! Great canyon though. I spent two nights in Kanab in 1975. My dad loved the place because of its association with the movies and some of the westerns he remembered. Thanks for the memory nudge! I admit that it was a little disconcerting, when the heavy rain started and we were in a narrow canyon. The several “flash-flood in a canyon” deaths reports in the month before did cross our minds. I bet Kanab isn’t that much different from what it was in 1975. That would have been in my mind as well! What a beautiful place, even if you had a bit longer of an adventure that what you had planned for. Some of your best photography–thank you!